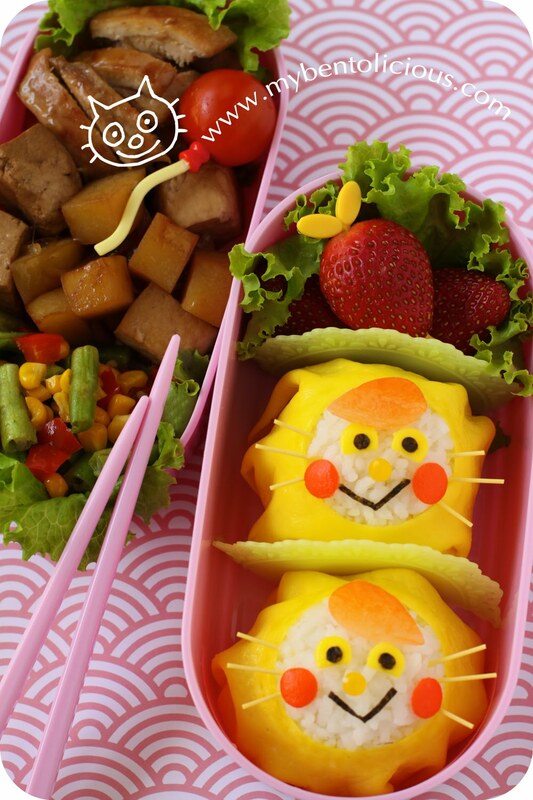 I wrapped two rice balls with yellow egg sheet to make two boys in cat suit. For decorating the face part, I used jelly ball, nori, dry somen, egg sheet, and carrot. Some strawberries were put to fill in the empty space on the top of the box. Inside the other box : stir fried veggies (green beans, red paprika, corns), sauteed tofu & potato with sweet soy sauce, cherry tomato, and chicken teriyaki. I feel pretty exhausted from yesterday. Lack of sleep just made me like veggie. Hope my kids will have extra energy because they will start their extra math lesson this afternoon at 4PM. They will have it twice a week on Tuesday and Thursday for one hour. Usually we arrive at home from school around 3, so the kids will still have 1 hour to have snack and a quick rest before they go to the extra math lesson. The place is pretty near our house, only less than 10 minutes. So hope the kids will enjoy it today! That is the cutest thing EVER!!!! I should really practice at making egg sheets, you do so many amazing things with them. Meow! love these adorable little boys in cat suits -- characters *in costume* is one of my all-time favorite bento genres, and your egg sheets are always admirably perfect. have missed your bentos lia, can't wait to catch up on all of your halloween creations from the last few weeks! I like the way your egg sheet-wrapped rice looks so neat. And also love the paper background a lot! Very nice. My boy has afterschool lessons until 5 on some days and it feels so rushed to come home, do homework, and eat dinner in those days. Let me know how you manage it so I can learn! Have a wonderful day Lia! Oh wow. Super mommy and super kids... hope none will get too exhausted..
Aww they are so cute in their little cat suits! One of these day I will try to make the egg sheets, its so cool! Wow! Yet another totally original bento vision. Just amazing and I really love the sunny colors here! Hope you are feeling much better today, Lia! Oh my goodness! This is so adorable!!! @JanJan : Thanks a lot JanJan!